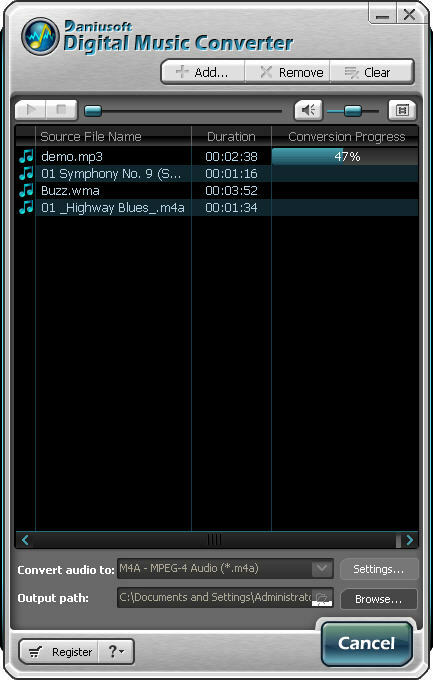 Daniusoft Digital Music Converter is a powerful yet easy-to-use DRM removal and audio conversion application. It provides you with the best solution to convert DRM protected music. The input formats include DRM video:wmv, m4v, asf; DRM audio: wma, m4a, m4b, aac; plain audio: wav, mp3, ac3.The output formats include: mp3, m4a, ac3, aac,wma, wav, ogg, ape. ...... Its DRM video conversion unit lets you extract audio tracks from various DRM video formats such as DRM WMV, DRM ASF, DRM M4V etc. This great application has the best way to convert DRM protected music, so that you can conveniently copy DRM protected music to numerous players such as iPod, PSP, Zune, Creative Zen, Archos etc. Convert DRM protected music to unprotected audio - convert DRM WMA to MP3, DRM M4A to MP3 etc. Extract audio tracks from DRM protected video such as DRM WMV, DRM ASF, DRM M4V etc. Convert music files between different formats. 1. Remove DRM from music such as DRM WMA, WMV, M4A, so that you can convert DRM protected music without any restrictions. A powerful yet easy-to-use DRM protected music converter. Converts and calculates MIDI keys, loop BPMs, delay times, sample size etc. Convert protected music to Creative ZEN. Remove DRM protected video & music for Zune. Qweas is providing links to Daniusoft Digital Music Converter 2.6.0 as a courtesy, and makes no representations regarding Daniusoft Digital Music Converter or any other applications or any information related thereto. Any questions, complaints or claims regarding this application Daniusoft Digital Music Converter 2.6.0 must be directed to the appropriate software vendor. You may click the publisher link of Daniusoft Digital Music Converter on the top of this page to get more details about the vendor.